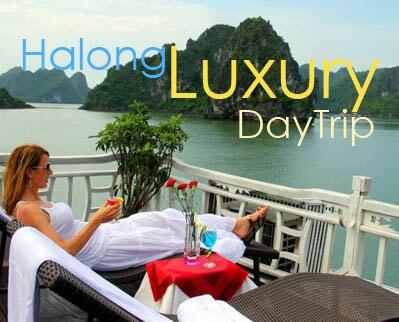 Hue – The former imperial citadel of Vietnam, is famous for its majestic yet romantic delicacy. It’s not a surprise when this royal city of Nguyễn Dynasty, the last reigning royal family of Vietnam, has a monumental complex of historical palaces and architectures. Among those, Minh Mang tomb is one of the most well-preserved sites that every tourist should visit once when they come to this city. 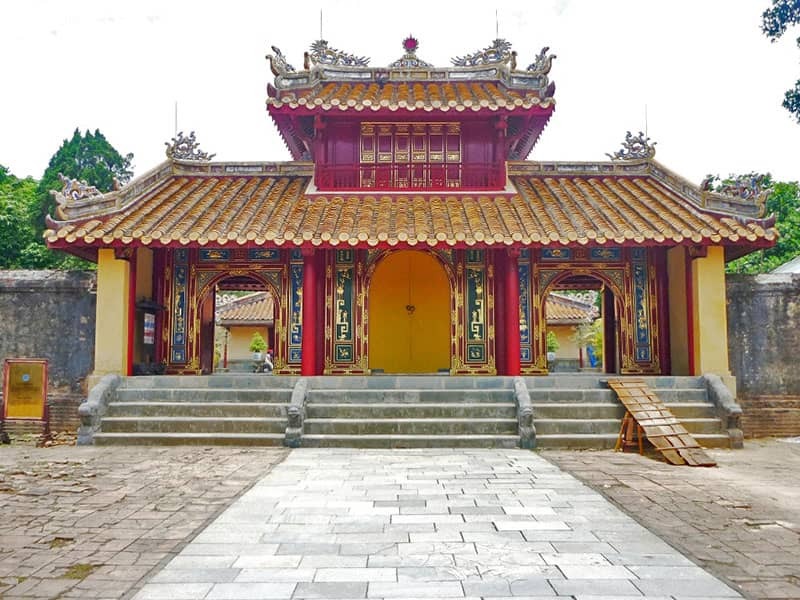 Located 12 km away from Hue City, on Mount Cam Ke and the west shore of Perfume River, you can reach this imperial Minh Mang tomb in about 20 minutes driving from Hue city center. If time doesn’t a matter to you, you can try the waterway, it definitely brings a once-of-a-lifetime experience when you can observe the mesmerizing, vibrant scenery on the shores along Perfume River – After 2 hours boat trip, here you are, the imposing imperial tomb of Minh Mang – one of the greatest Emperors of Nguyễn Dynasty. 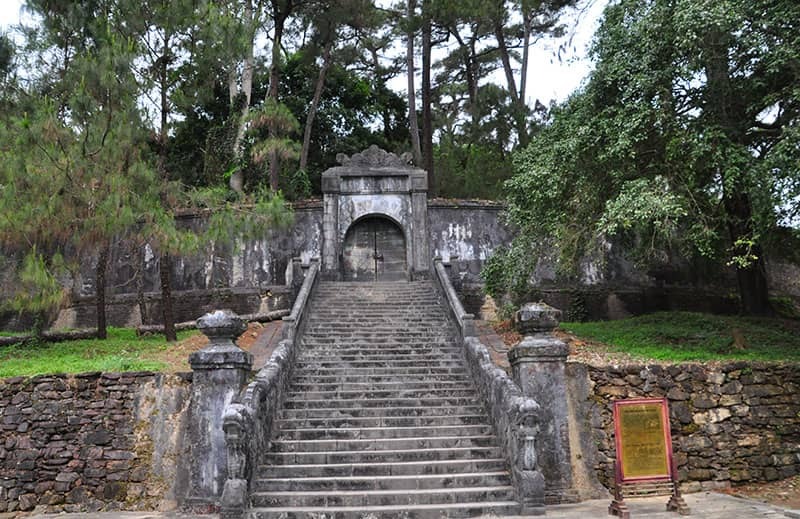 Even Minh Mang King had appointed design and location himself, the tomb was built mostly by his successor and son – Thieu Tri King during the years 1840 to 1843 since Minh Mang had passed away in 1841. Covered an area of 18 hectares, surrounded by a wall enclosing within 40 historical structures included palaces, temples, and pavilions, doubtlessly, Minh Mang Tomb is considered to be the best combined natural landscapes and architectural complexes. 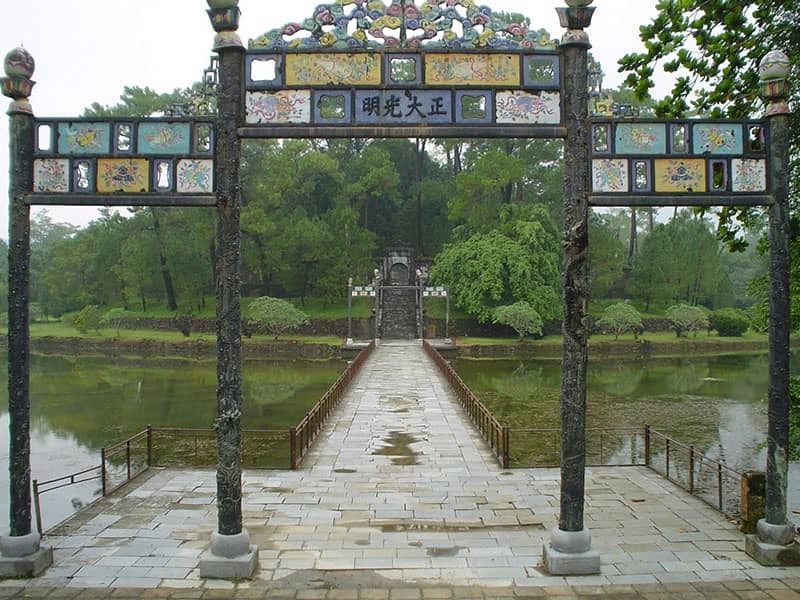 As a staunch Confucian, a ruler was known for his firmness of character, Minh Mang’s personality is clearly reflected by the design of his resting place. The briefest and most accurate way to describe Minh Mang Tomb will be rounded up by two words: symmetry and grandeur. The structure of the tomb is a symmetrical central axis with the axis called trail Thần Đạo that leads you throughout the architecture. As the gateway to the complex, Đại Hồng Môn Gate has three openings, the right, and left side as well as the central. Please note that you only can enter by the either the left or the right gate but not the central one which was only used by the Emperor himself. Crossed Đại Hồng Môn Gate, you officially entered the tomb site and found yourself at the Forecourt, also known as the Honour courtyard. In this yard, notably, you will see a traditional double row of statues represent mandarins, elephants, and horses. 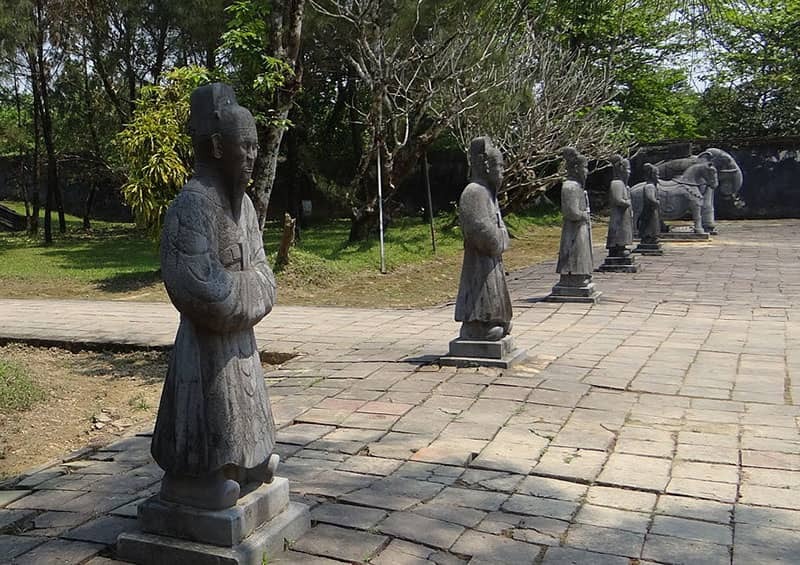 Also from here, you can easily walk to one of three staircases which lead to the square Stele Pavilion, a large pillar carved with the biography of Minh Mang, the Emperor had conquered the largest territory ever in Vietnam’s history. 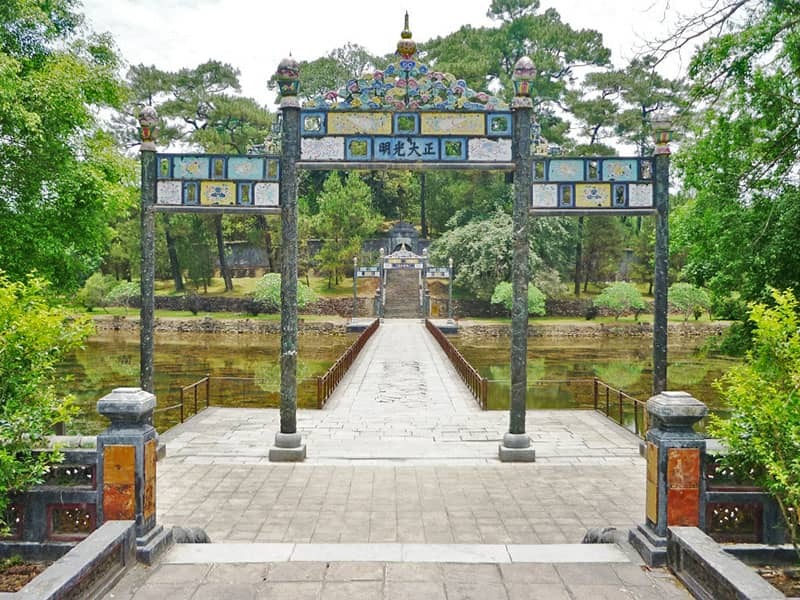 After a series of courtyards and gates, Hiển Đức Gate will lead you to Sùng Ân Temple, where the glorious Emperor and his beloved Empress Tá Thiên are worshiped. From Sùng Ân Temple, with a few more steps, crossing three stone bridges, Trừng Minh lake, Minh Lâu Pavilion and Tân Nguyệt Lake will be in your eye sight. Being a UNESCO Heritage site, Minh Mang Tomb promises you a memorable trip to the land rich in history and culture of Hue imperial city. 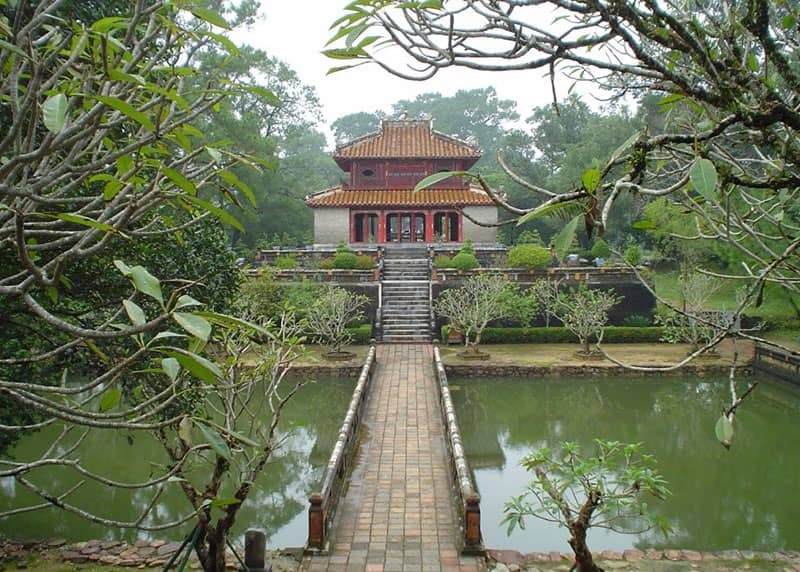 Travel with us on Hue day tour to explore this imperial Minh Mang Tomb.